In September of 2018, while enroute to the Wine Bloggers Conference in Walla Walla, I found myself at Cristom Vineyards during harvest of their 2018 Vintage. The fruit was coming in from one of the estate vineyards that produces the delicious Mount Jefferson Cuvee Pinot Noir. The harvest was bountiful, in fact, it was much more abundant than anyone was expecting. With an intern down with a minor injury, I jumped on the sorting table to help out. I also had time to shoot a short video. Enjoy. 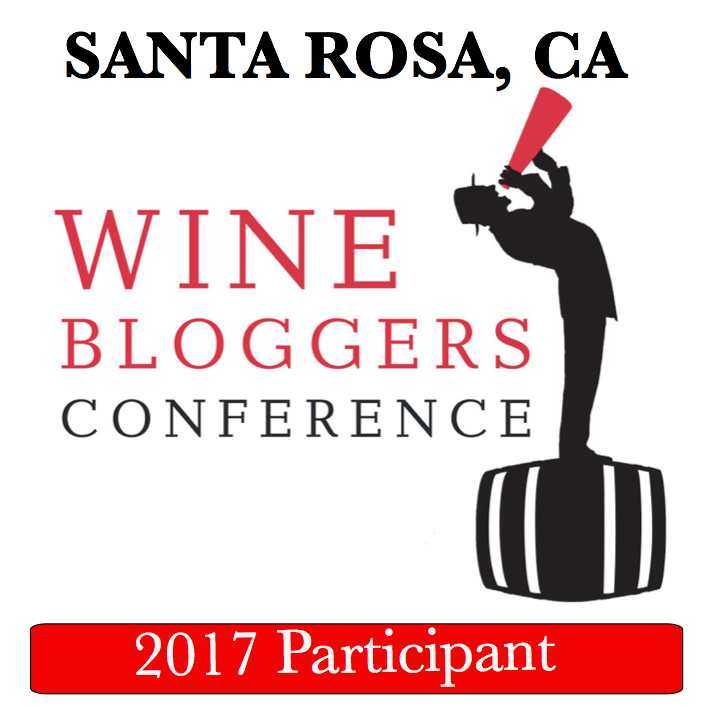 Check out more great wine content below. You Don't Need Expert Advice to Pair Wine with Thanksgiving Dinner. 7 Ways to Consistently Drink Bad Wine. Talking German Wine with Dirk Richter: The Complete Interview. Max Ferd Richter. 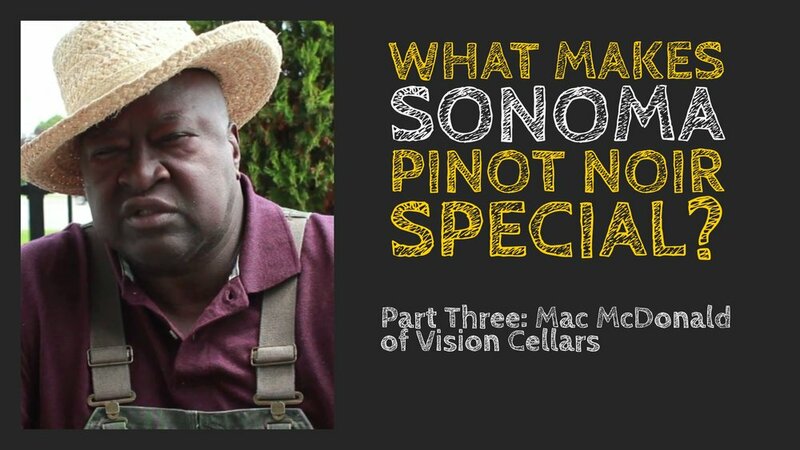 This the third part of my video interview with Mac McDonald of Vision Cellars. In this segment, McDonald talks about why Sonoma County is such a great place for Pinot Noir and why it is special. The first part of the interview is here. "From Rural Texas to Napa Valley Wine Country." The second part of the interview is here. "How (and Why) to Grow Pinot Noir." Please enjoy this six minute video or read the transcript underneath it. This is Episode #57 of Understanding Wine with Austin Beeman. From my mind, what makes California fruit a little bit more consistent is that we've kind of figured out what type of soil condition, what type of weather patterns that you have is the best area to grow Pinot Noir. We've found that nice cooler areas, cool at night, maybe when it's a little bit warmer during the day, you know 80s is not to high into the 100s and stuff like that. Well, its more ideal for drinking and making Pinot Noir because you don't get the over ripe fruit all the time, unless you purposely trying to do that. So I think we are a little bit more consistent and we do have a tendency to get a little bit more alcohol you see than Burgundy or Oregon. I think when you look at Northern California, I think we're pretty consistent in finding a good location to grow Pinot Noir and I think that, that's really the determining factor. Burgundy, you know they don't get a lot of heat and in that Burgundy area. So your alcohol normally is not as high and the wine can last a lot longer. Of course, we make our wines in California so that they'll be able to be consumed a little bit earlier. Now when I get into California itself and I think about Carneros, I think about a more dense, maybe a little bit more hardier of Pinot Noir because you don't have a lot of hot, hot weather in that Carneros area. It's quite close to the water. You get over into Sonoma County where I live, Sonoma County, Russian River Valley, ideal for Pinot Noir. Our property is maybe three quarters of a mile from the Russian River, which is nice and cool in there. When the ocean itself is about 45 miles away. It's nice and cool in that Russian River Valley, where you get up in the 80's, once in a while you get up, you know 95 or something like that, but normally it's in the 80's and at night it kind of cools down so you get more of a cherry, real ripe plum kind of a fruit from that area, not as dark as it is in Carneros. Then when you get down to Monterey County, to the Santa Lucia Highland, particularly upper part of the Santa Lucia Highland, around Solidad, in that area. I purchased fruit from the Gary's in Rosella's Vineyard and a Las Ventura's vineyard that's owned by the Wagner family, and I tell you, that's an ideal area itself for growing Pinot Noir. You still get that little dense kind of a fruit there. The acid can be high in that area, a lot higher than it is in I say Russian River Valley, Sonoma County, or Carneros, or in Napa area and part of it is in Sonoma. The acids can be pretty high down in the Santa Lucia Highland and into Monterey County. When you get down past Santa Barbara and that area, now you're picking up a little bit more ripe of fruit, a little bit lighter fruit and you can kind of get more of what I call that candy apple kind of a bright sweet kind of a real cherry, real not wild cherry, but real bing kind of a light cherry kind of a wine. With maybe a little bit of berries and the typical raspberry flavors down there. I don't think that, that's a problem with that, but I think we're consistent in all the areas that we're making Pinot Noir in, but finding out that the temperature in except in those areas makes a big difference in how Pinot Noir should be coming out and how the trellising of the vines and how you can actually get the exposure to the grape to the sun shine that you need, but we can't change the sun. We can change how the sun hit the fruit itself by the way we prune it or by we go out and pick the leaves off of it. So I think overall, California's learned how to farm is the bottom line. Now Oregon, a lot of folks in Oregon they kind of maybe live there, made wine in California so they've taken a lot of the practice up there that we had. They started out in Oregon using the fruit from that area and not trying to make it a California Pinot Noir style. They started out real light. They're gonna get a lot of sun, lot of heat. So they were able to just make a wine from the area and it was so different than California and I can remember when I used to go up there and I'd taste those Pinot Noir's and I use to think, "Oh, what do these guys think they doing?" Because, I was suggested to drink in a little bit different style of Pinot Noir. But I think overall, they doing a great job. They're making their Pinot Noirs up in Oregon and parts of Washington as well now. This the second part of my video interview with Mac McDonald of Vision Cellars. In this segment, McDonald talks about the reasons he chose to pursue great Pinot Noir and the challenges of working with such a complicated and finicky grape. This is Episode #56 of Understanding Wine with Austin Beeman. Direct Download Link. Mac McDonald of Vision Cellars discusses why he chose to grow great Pinot Noir and the complex challenges that he faces. Pinot Noir is what we do. Folks often ask me, why do you choose or select the toughest type of grape? Well, number one, in California, Northern California, and you want to make Cabernet unless you come out of Napa Valley, folks normally think it's not that good. So I thought if I could craft a great Pinot Noir, because Burgundy is the same grape, that if I could craft a good Pinot Noir then I think I could play with the big dogs. I'm pretty competitive in everything that I do so I want it to be good, I want it to make a mark for doing what I was doing. And at the time as a winery in California called William Seylem that I thought was doing a great, great job and then I also thought Sanford down in the Santa Barbara, those are the only two great Pinot producers that I thought was really, really good and I thought if I could make a great, great Pinot Noir then I could compete. That's why they was selected. I had no idea all the crazy things about that grape even exists but I'm a pretty fast learner so I learned a lot about it. Well, it's a real challenging thing because if you think normally about the clones of a Pinot Noir grape, the challenge of growing the grapes, making the wines and selecting the right yeast and keeping the temperature at a certain control. To start off with, you have to really know your soil condition and really match your soil condition with your root stock. Root stock, how much water you have, the soil condition, how much you want to grow per ton, like a Sauvignon Blanc, it doesn't care, it's like a weed, you can just overload it with tons and tons of fruit. In the Chardonnay world, let's say, you have about 50, 60 plus clones some place in their different varieties, different clones. Same with the Sauvignon Blanc, Chardonnay and Cabernet Sauvignon, you have about 50 or 60 there. But in the Pinot world, you have about 11,000 clones. These things just mutate, you start out, for example, with a 667 or a 777 clone and you may have one side of the road, you may have this clone planted over there, the other side another different clone and they'll completely go different flavors. Then you get into the pruning process of it. You talk to different Pinot growers and they have different methods of pruning and I just like a little bit of exposure to my fruit. So it's really consistent with leaf picking, in other words, if you get more sun on the east side you may wanna leave a little bit more leaves on that. You don't get enough on the west side of the vine you may want to pull some of that off. So it's a constant juggle of trying to get the ripeness, in the evening ripeness, on the fruit itself. Austin Beeman: Isn't that challenging? Yeah, it's pretty challenging and like I said, we all, a lot of us have different thoughts about it but I think we all come into an agreement. That's why we've been able to craft better Pinot Noir in California. It used to be, like I said, Brett William was the king of it but now you've got a lot of folks making great Pinot Noir. In fact, even here in the state of Ohio, they have a Pinot program, it's doing pretty good. I gave a big lecture at Ohio State several years ago on the crafting on Pinot Noir and I came back and tasted what some of the things that they made and they doing pretty good. But it's a real tough grape to grow. There's a whole bunch of choices of selections of yeast that you use to ferment your fruit and that makes a big difference in the end result of the flavor. The type of yeast you use helps determine the flavor you get on the end and then you have the other extreme of that, barrel selections is really, really critical because in my mind, a Pinot Noir should be treated like a white grape. It's a delicate thing. You can get too much wood on it or you can get too much alcohol in it. I'm not saying that if you don't like high alcohol Pinot Noir you shouldn't buy them but I'm just thinking that 13.5, 14.5, in there, is ideal alcohol level for a Pinot Noir. Now with that said, sometimes your vineyard, your fruit is just not there. Out of 25 bricks, equivalent to a 13.8, 13.9 of Pinot Noir and so you may have to let the alcohol get up a little bit higher because it's a little bit riper, so the riper it is, the higher the sugar content and the higher the sugar content is, higher the alcohol is gonna be in the finished product. So it's kind of an up and down thing with that grape in that sense as well. Without the established rules of Europe, how do American Winemakers discover great new terroir? For St. Innocent's Winemaker Mark Vlossak, it is all about inspiration. In this short six minute video, Vlossak talks about the different subregions of Oregon's Willamette Valley and what he find so inspirational about each of them. This is Episode #50 of the Understanding Wine with Austin Beeman video podcast and the fourth of five videos from my interviews with Mark Vlossak of St. Innocent Winery. Click below to see the other parts of the interview. If I ask you to name Italy's great sparkling wine, you'd say Prosecco. Right? Sorry, wrong. There is no denying that Prosecco has exploded throughout the wine-drinking world, conquering the category of 'value-priced sparkling wine.' But it didn't have to be this way. The region of Franciacorta in Northern Italy produces some of the world's greatest sparkling wine - and have for a long time. This four minute video, produced in Franciacorta by Ben Shapiro and Jeremy Parzen in Franciacorta, gives you a brief look at the people, place, and food of the great Italian Sparking Wine Region. Enjoy. Get ready for a master-class on the specifics of terroir in the Willamette Valley of Oregon. If you ever wondered why Oregon is so exciting a wine region, this video will make it very clear. Join us for eleven minutes with St. Innocent Winery's Mark Vlossak. It's well worth your time! Vlossak discusses the intricacies of terroir and how New World Wineries - such as those in Oregon - deal with discovering and using it. The focus is on why factors influence terroir. 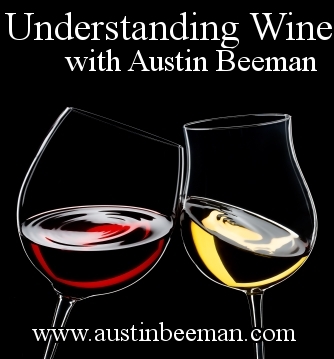 This is episode #49 of Understanding Wine with Austin Beeman. This is part three of a five part video with Mark Vlossak. Part two can be found here. My interview with Wynne Peterson-Nedry of Chehalem Wines is here. Lots more Oregon wine videos are at this link. Similarly to other places that produce high quality Pinot Noir, Oregon's Willamette Valley is divided into many regions and subregions - each producing their own unique flavors and textures. St. Innocent Winery's Winemaker Mark Vlossak talks in this video about those subregions and how they came to exist. This is the 2nd of 5 videos featuring Mark Vlossak that I produced during my 2012 trip to Oregon. The first video "Understanding Oregon Pinot Noir" can be found here. I interviewed Mr. Vlossak in the cellars of St. Innocent Winery. This is episode #48 of Understanding Wine with Austin Beeman. Link to Part One of the Video Interview with St. Innocent Winemaker Mark Vlossak. Link to the complete collection of videos from my 2012 Oregon Wine Trip. Link to another great Pinot Noir producer: Jim Clendenen of Au Bon Climat. Who doesn't love some high-definition video of a beautiful winery? Cantina Argiano has just released a majestic video, featuring aerial videography (probably from a minicopter) that soars above and around their Brunello di Montalcino vineyards. Argiano also has an excellent english-language website. Enjoy. In the summer of 2012, I had the opportunity to sit down with Chehalem Winery's Wynne Peterson-Nedry. It was a rare blast of hot weather in Oregon with temperatures rising into the high 90s. It was a pleasure to stay in the shade and sip from the many dry white wines that are strongly featured in Chehalem's porfolio. Chehalem Winery, a family operation, was transitioning from Father to Daughter as well as experiencing a dramatic change in their label design. I spent about a half hour with Ms. Peterson-Nedry and the highlights of that interview form Episode #46 of Understanding Wine with Austin Beeman. We spoke about the history of Chehalem Winery, where Oregon fits among world Pinot Noir regions, and why you should think about Riesling when you think Oregon Wines. If in Ohio, you can buy Chehalem wines at Walt Churchill's Market.